Those interested can choose from approximately 50 courses at five faculties in Magdeburg and two faculties in Stendal at the University of Magdeburg-Stendal that was founded in 1991. 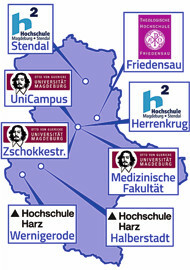 Some 130 professors provide a very good attendance rate among about 4,500 students in Magdeburg and more than 1,900 students in Stendal. The Stendal Campus in the Osterburger Straße is marked by extensive green areas between the restored former barracks. Approximately 2,000 students currently study here. The nearly 1,000-year-old Hanseatic city of Stendal in the Altmark in northern Saxony-Anhalt is located not far west of the Elbe River in the southeastern Altmark. Berlin is about 120 kilometers, Hanover is about 150 kilometers and Magdeburg is about 55 kilometers away.